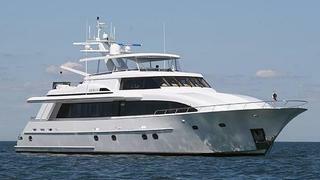 Gregg Child at Northrop and Johnson in Fort Lauderdale sends news of another price drop on his central listing, the 35.5m motor yacht Kapalua. A Crescent 115 model delivered by Crescent Custom Yachts in 1996, Kapalua was built to a design by Jack Sarin and refitted in 2006. Ten guests can be accommodated in one master, three doubles and one twin cabin and everything in the engine room was recently replaced or rebuilt, including two brand new 1900hp Caterpillar engines. Available to view in Fort Lauderdale, Kapalua is now down from $4.25 million to $3.95 million.